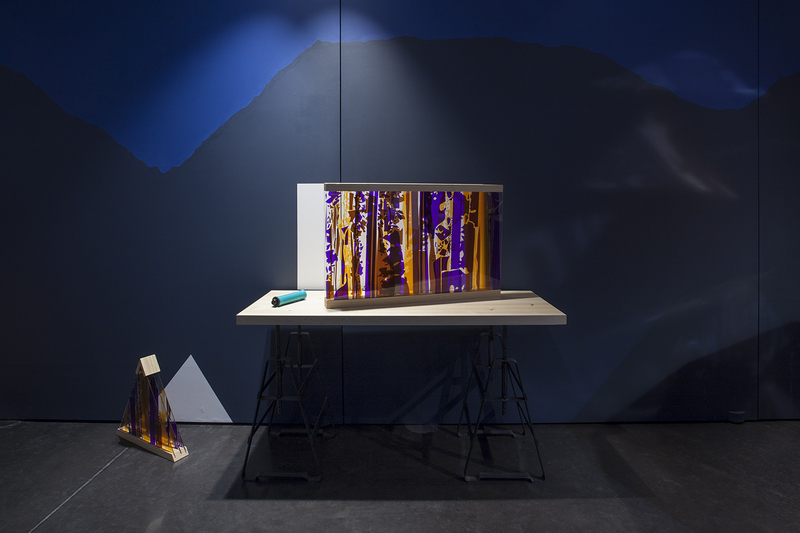 For her first individual exhibition in Poland, Angelica Teuta has altered the entire space of the Kasia Michalski Gallery with a site-specific installation. 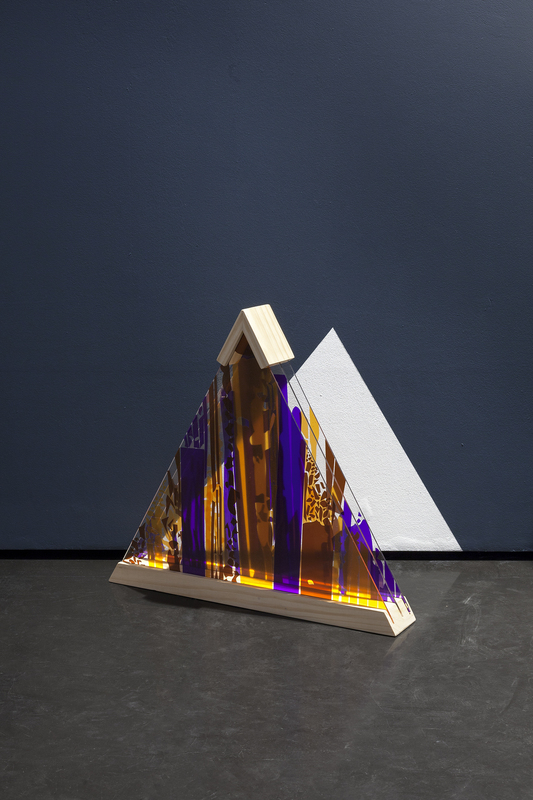 Utilizing elements of architecture, sculpture, found objects, painting, and colorful light projections, the Colombian artist has constructed an immersive, interactive environment, willingly juxtaposing the archetypes of nature with their artificial interpretations in a temporary symbiosis within the windowless white cube. Deeply engaged with the idea that art has to be in junction with life, Teuta appears as a keen observer of our living situation, understanding the human nature and the social construction of our needs. Fascinated by the ways people develop skills to make themselves at home, she has come up with the concept of “emotional architecture”, studying how space affects our well-being, and how our emotions can transform the space. 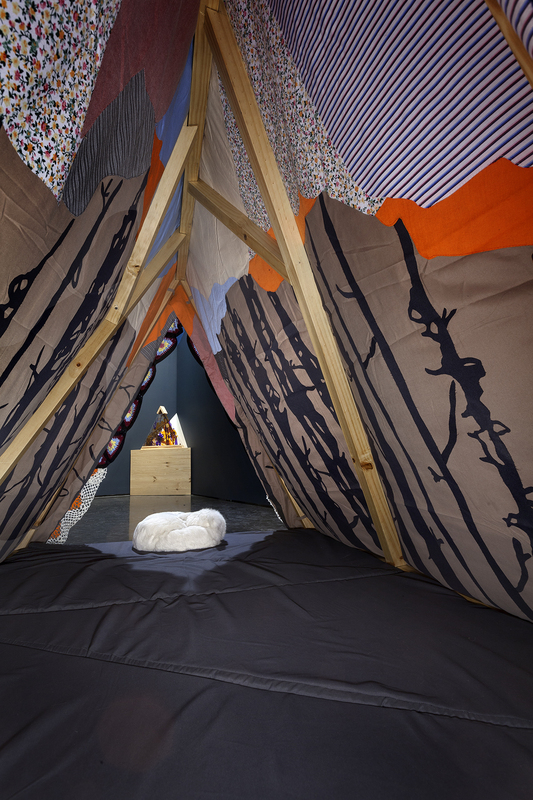 Once experienced, Teuta’s site-specific works unveil the artist’s beliefs about comfort, encouraging exchange and providing shelter. 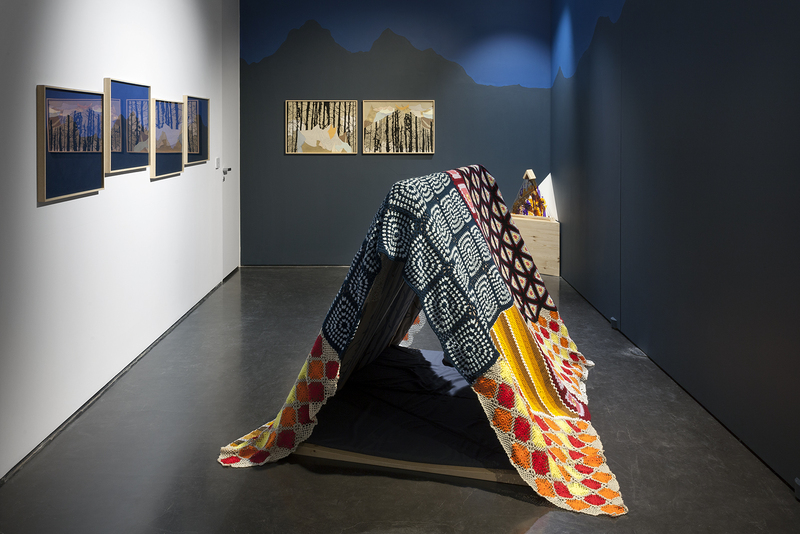 Her structures—wooden domes, hand-crafted tents, or tree-houses inspired by nomadic and vernacular architecture, emergency constructions, and DIY manuals—are often created and recycled in collaboration with the artist’s friends, family members, as well as occasionally made for deprived communities, in a mutual exchange of knowledge and abilities. 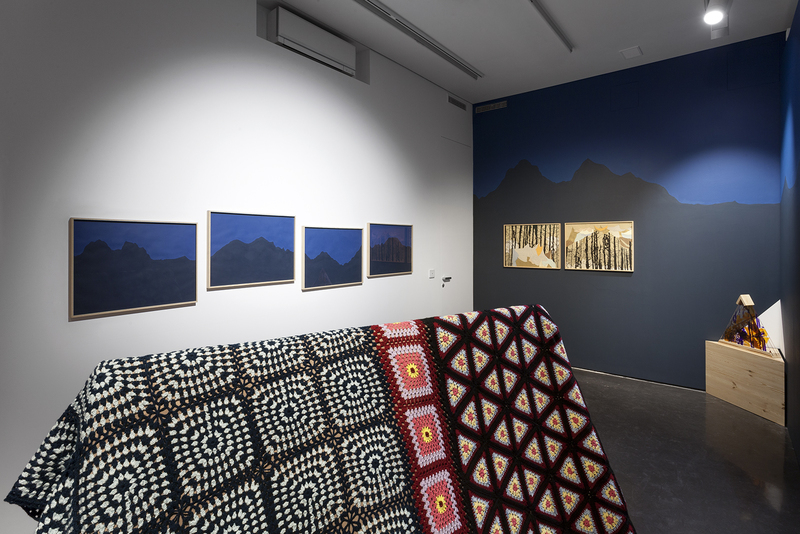 In Forest Houses Tent Shelters Forest, the gallery walls are covered with a mural envisioning a nocturnal mountainscape reminiscent of 19th century imagery. 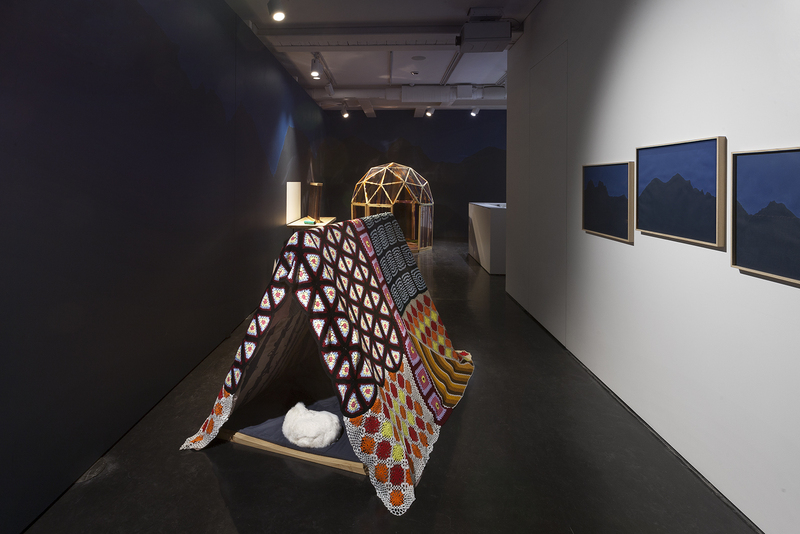 In the middle of the room, a small geodesic dome and an archetypical tent overlaid in crotcheted blanket make for a hideout from the pressures of the everyday. 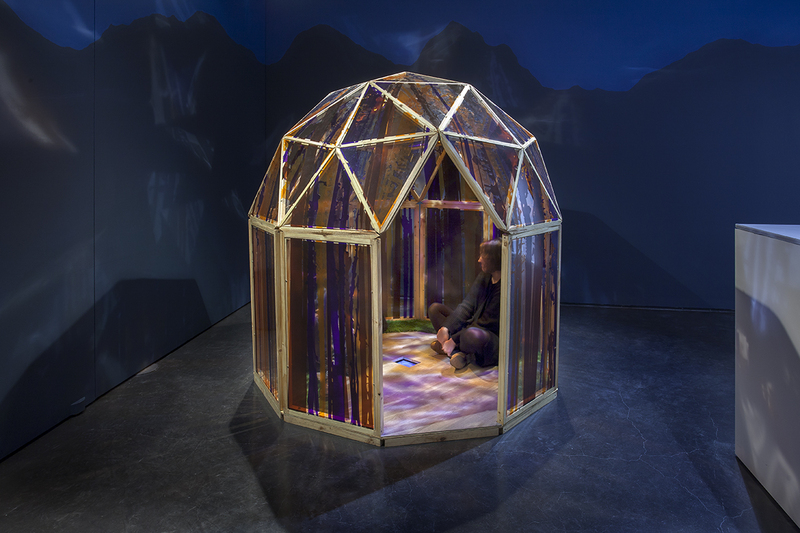 The viewer is invited to step inside and delve into his/her own thoughts, among soothing shapes, colors and sounds. 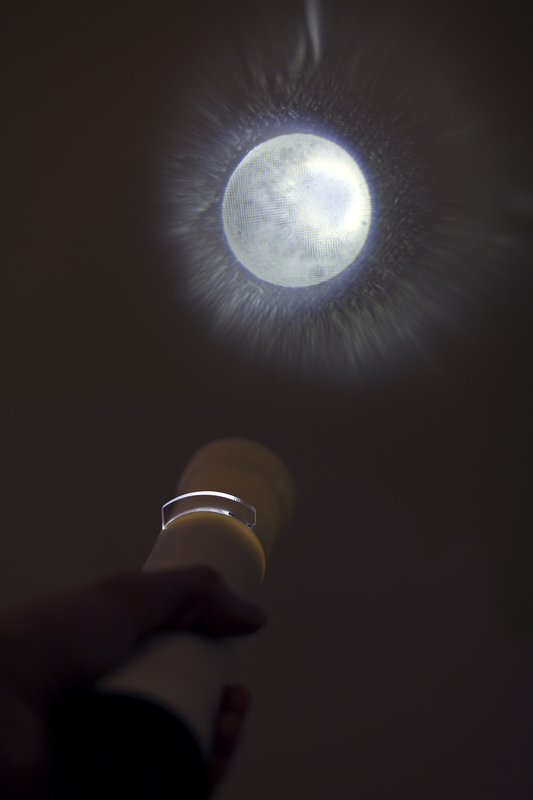 While torchlights are used in order to project images in a shadow play on the gallery’s walls, the viewers can set out on an introspective journey into their childhood memories and dreams. 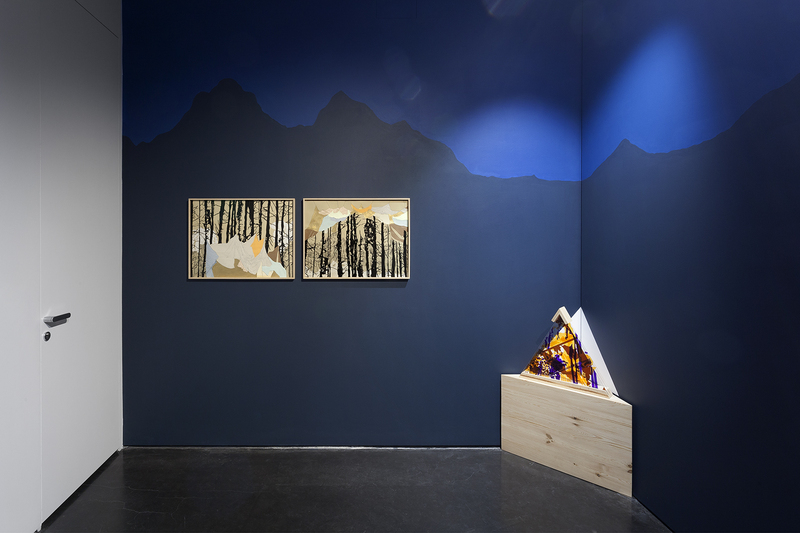 The exhibition is supplemented with a selection of the artist’s collages and sculptures, built using elements recovered in the process of fabricating the installations.